Two thousand years ago, not long after the Amarrians ventured out into space, an emperor whose name now is known to few came into power. His legacy still reverberates throughout the Amarr Empire, a legacy born with his death, a legacy far different that the one he intended for himself. He was called Zaragram II and since his death his name has been a curse word for the Amarrians, for none more than the Ardishapur family that spawned him. At that time, the status of the Amarr Emperor, though undoubtedly the head of state, was still subtly different. He was the leader of the Apostles, the first among equals, and his authority was channeled through the Apostle Council. But Zaragram hungered for more direct power; he wished to elevate himself above the common clergy into godhood itself. He regarded himself as the worldly manifestation of divinity. As soon as he came into power Zaragram started issuing decrees, most of them religious in nature. Many of these decrees directly usurped the Scriptures and many of the most sacred traditions of Amarr society were uprooted and eradicated. Then Zaragram set out for his most ambitious project. He wanted to 'get in touch' with his supernatural self and to accomplish this he set out to construct the city of god - a place worthy of divine residence. The city was to be constructed in space, not bound to any earthly place, and was to be the eternal legacy of Zaragram's II greatness. Zaragram named his city Mezagorm, meaning Vision of god, though it was commonly known as City of god. Things came about differently than Zaragram wished. Just when the construction of his glorious city, located in the system of Shastal, was completed emperor Zaragram was assassinated. Having accumulated so many enemies by then, any one of dozens of groups could have been responsible. After his death the Apostle Council became all-powerful for a short while and they did their utmost to bury his memory. His decrees were reversed, all icons and pictures of him where either destroyed or his face and name scraped out, and his city was laid to waste. In a few generations his name was all but forgotten. Instead of the glorious legacy Zaragram envisioned for himself, his rule contributed to the power of the Apostles and the Moral Reform it brought about some 500 years later. 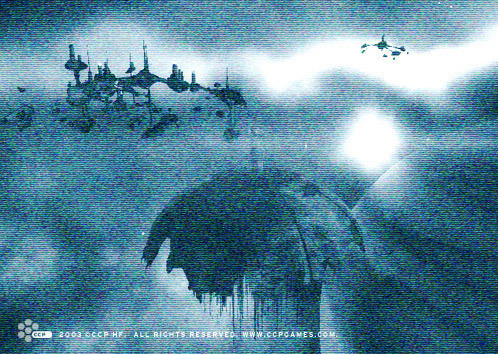 Deep space is a gentle resting place and the ruins of Zaragram's city are still there to be seen. The city was a sprawling place and it scattered remains are visible for miles around. Some say that Zaragram's spirit still haunts the place, gliding between the rubble of his city, but others say it's only the looters having a field day.